Found 4 file extension associations related to Adobe Extension Manager and 4 file formats developed specifically for use with Adobe Extension Manager. Adobe Extension Manager or Extension Manager CC is used to manage and install new extensions to Adobe Creative Suite and Creative Cloud applications. 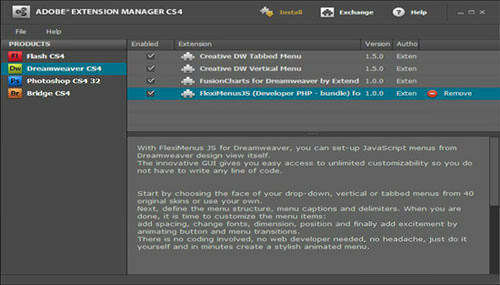 Easily install new extensions and manage the ones you already have with the Adobe Extension Manager. It runs side-by-side with most Adobe Creative Suite applications. If you need more information please contact the developers of Adobe Extension Manager (Adobe Systems Incorporated), or check out their product website.